The Puerto Rican defeated Colombian Monica Duque. Monica Puig gave Puerto Rico her fifth consecutive gold medal on Monday in women's singles tennis in the Central American and Caribbean Games in Colombia. Puig, the champion in the Mayagüez 2010 and Veracruz 2014 games, won in two sets, both 6-1, against Colombian Mariana Duque. The tennis player has continued the winning streak for Puerto Rico in the regional match that launched Kristina Brandi with gold medals in the El Salvador Games 2002 and Cartagena 2006. At the end of the match, a smiling Puig dedicated the medal to Puerto Rico, according to El Nuevo Dia. "Puerto Rico, this is for you. Thank you for never losing faith. Thank you for believing in me, supporting me. Let's get on our feet," the athlete said. "This record is for you all." When asked about the competition, Puig noted her surprise at how easily she won. She thought there would be three sets because whenever she's gone up against Duque, they've had close matches. "I felt really good, focused on the match. Very disciplined. From the start, I began with my plan and I never abandoned it. I served very well. I hit back very well. I played the points very well. Simply stated, I don't think I made many errors," she said. The Olympic champion arrived in Barranquilla after a few weeks of inactivity due to a hip injury. 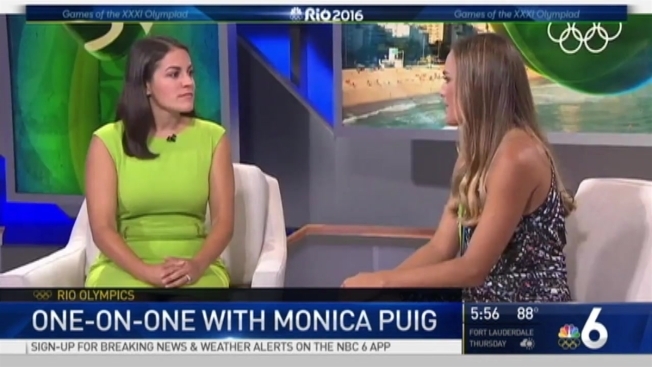 Puig will return to the tennis arena this evening in a match alongside fellow Puerto Rican Monica Matias, to compete for the bronze medal in women's doubles. Their rivals will be the Bahamians Robin Pratt and Danielle Thompson. Histórica Victoria de la boricua. La primera en ganar tres medallas de oro consecutivas en los Juegos Centroamericanos y del Caribe.